As you know, today is the winter solstice--the shortest day of the year, the longest night, and technically, the first day of winter. I know that some of our Language Ambassadors who hail from much warmer climates would question that assertion here in Minnesota---it seems to some that winter has gone on forever already! From here on out, our hours of daylight begin to incrementally creep back up, and we are on the path to spring--in fact, our sunsets have already begun occurring a bit later the past week or so. For years now, cultures around the world have celebrated this return of the light, agrarian societies have taken note of the status of their food stocks, and many people have done an assessment of their year in review. In fact, the word solstice comes from Latin, meaning Sol= Sun, and Sistere=To stop, or stand, because the sun actually appears to take a brief cessation in the sky. It makes sense for us to pause as well--to take stock, to give thanks, and to look forward to the new year. It has been a wonderful first half of the school year here at ISLA. 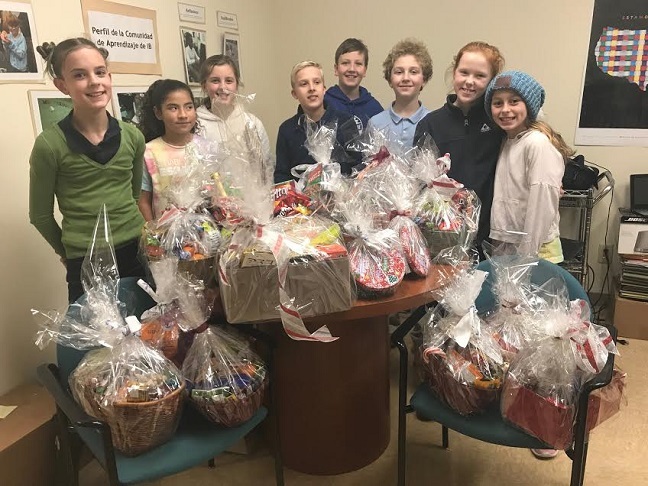 We would like to thank all of the families who participated in giving to the gift baskets for the ICA food shelf-- we were able to donate up to 150 pounds of food, all packaged in attractive gift baskets by the student council. We would also like to thank all of you who voted in the Reader’s Choice Awards from the Sun Newspapers--as we were voted the Best Public School, Best Summer Camp, Best Principal, and Best Teacher (Claudia Holzbauer). We would also like to congratulate the entire community of ISLA, for once again being named a “High Quality Charter School” by the Minnesota Department of Education. This identification is based on a Comprehensive Performance Framework (CPF) that incorporates multiple measures of a school’s academic, operational and financial performance. The results just came out this morning, and only 40 out of 164 charter schools received this distinction. Thank you all for your donations! Our Student Council put together fourteen baskets for the ICA Food Shelf. It was more than 150 lb of food. Hour of Code at ISLA this week. Students in all grade levels had an opportunity of coding for one hour with activities picked by 6th graders in the school. Students had an amazing time! NJH 6th Grade Parent registration information night is at 6:00-7:30 on Thursday, January 11. 6th Grade parents interested in registering their child at North Jr. High next year should plan on attending.